Calling all sleuths! A murder most foul has been discovered on the renowned Baker Street, quite possibly involving its most famous resident. Scotland Yard needs your help investigating the crime. Could detective-extraordinaire Sherlock Holmes truly be behind this crime or is there something bigger going on? The game is afoot! Epic Team Adventures is proud to announce Scotland Yard: The Baker Street Affair, a two-hour immersive puzzle adventure that will take place on May 20th, in Seattle. Gather a group of four sleuths and join us at the the Hyatt Olive 8 Hotel to crack the case. If your investigatory skills are up to snuff, you might just get promoted to full Inspector! 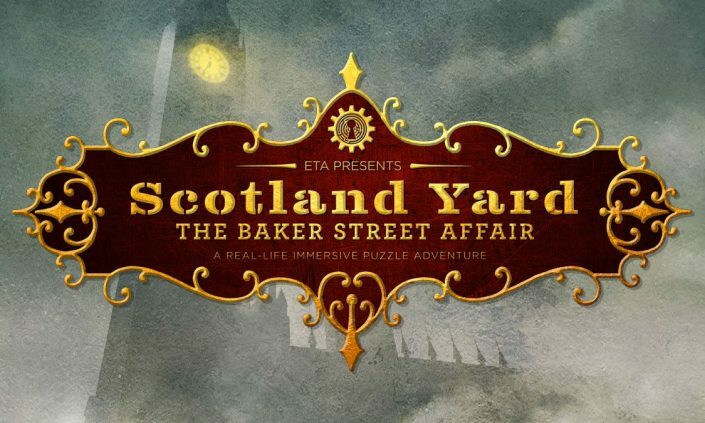 To provide all teams with a narrative-driven, immersive puzzle adventure, ETA has designed Scotland Yard: The Baker Street Affair to incorporate several mini escape game experiences. All teams of detectives will enjoy private access to key locations such as Sherlock Holmes’ study at 221B Baker Street. Completing short interactive and thematic puzzle games at key locations within the allotted time will reveal information invaluable to solving the overarching case. Between investigations of key locations, teams may follow leads and find clues in a 6000+ square foot elaborately decorated Victorian London set. This event is a 2-hour immersive puzzle adventure, which can accommodate up to 25 teams (each with 1 to 4 players) simultaneously. As a thank you for purchasing admission to The Baker Street Affair, each team will receive a unique coupon code via email giving a $5 per-person discount which applies to any of ETA’s escape rooms and puzzle rooms. Each team member may use your team’s coupon code twice. The coupon code is valid only through May 31, 2017. However, the code may be used to book sessions for any available date. Note that all people in your party will receive the $5 discount even if they did not attend The Baker Street Affair. Location: Hyatt Olive 8 Hotel ballroom in downtown Seattle Washington.